In each issue of Today’s Veterinary Practice, Pet Health by the Numbers correlates an article topic with statistics provided by Banfield Pet Hospital (banfield.com). These statistics are extracted from data collected from the medical records of nearly 2.5 million dogs and nearly 500,000 cats presented to more than 920 Banfield Pet Hospitals in 2015. 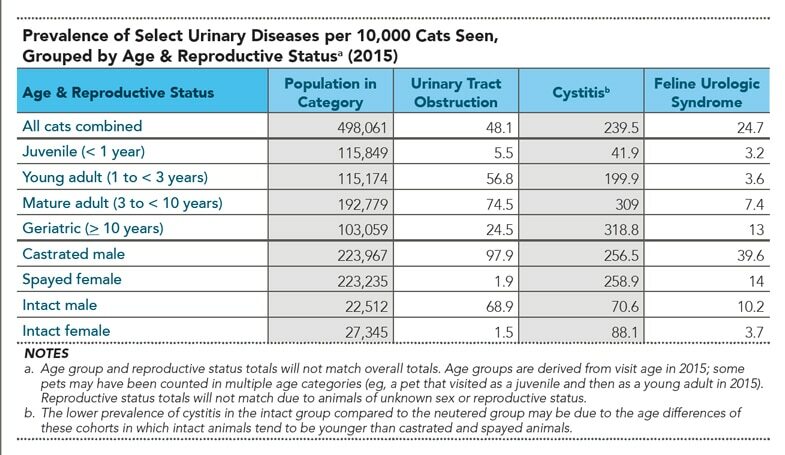 The following table outlines the prevalence of cats with urinary diseases presented to Banfield Pet Hospitals in 2015. Feline urethral obstructions are discussed in Feline Urethral Obstruction: Diagnosis & Management. Path to Pet Wellness: This dataset is an interesting look at the diagnosis of cats presented to their primary care veterinarians with lower urinary tract signs (LUTS). The main causes of both obstructive and nonobstructive LUTS in cats include feline interstitial cystitis, urolithiasis, urethral plugs, bacterial infection, anatomic abnormalities, and neoplasia. From this data, only a small number of cats were identified as having feline urologic syndrome (FUS)—a term that historically had been used to describe cats with idiopathic LUTS with or without urethral obstruction (UO)—when all other causes have been excluded.1 This term has been largely replaced by feline idiopathic or interstitial cystitis (FIC), which may explain the low number of cats with the diagnosis of FUS. Buffington CA, Chew DJ, DiBartola SP. Interstitial cystitis in cats. Vet Clin North Am Small Anim Pract 1996; 26:317-326. Buffington CA, Chew DJ, Kendall MS, et al. Clinical evaluation of cats with nonobstructive urinary tract diseases. JAVMA 1997; 210:46-50. Dorsch R, Remer C, Sauter-Louis C, et al. Feline lower urinary tract disease in a German cat population. A retrospective analysis of demographic data, causes, and clinical signs. Tierarztl Prax Ausg K Kleintiere Heimtiere 2014; 42:231-239. Gerber B, Boretti FS, Kley S, et al. Evaluation of clinical signs and causes of lower urinary tract disease in European cats. J Small Anim Pract 2005; 46:571-577. Jones BR, Sanson RL, Morris RS. Elucidating the risk factors of feline lower urinary tract disease. N Z Vet J 1997; 45:100-108. Kruger JM, Osborne CA, Goyal SM, et al. Clinical evaluation of cats with lower urinary tract disease. JAVMA 1991; 199:211-216. Saevik BK, Trangerud C, Ottesen N, et al. Causes of lower urinary tract disease in Norwegian cats. J Fel Med Surg 2011; 13:410-417. Lekcharoensuk C, Osborne C, Lulich JP. Epidemiologic study of risk factors for lower urinary tract disease in cats. JAVMA 2001; 218:1429-1435. Lund HS, Krontveit RI, Halvorsen I, Eggertsdóttir AV. Evaluation of urinalyses from untreated adult cats with lower urinary tract disease and healthy control cats: Predictive abilities and clinical relevance. J Feline Med Surg 2013; 15:1086-1097. Gerber B, Eichenberger S, Reusch CE. Guarded long-term prognosis in male cats with urethral obstruction. J Fel Med Surg 2008; 10:16-23. Nevins JR, Mai W, Thomas E. Associations between ultrasound and clinical findings in 87 cats with urethral obstruction. Vet Radiol Ultrasound 2015; 56:439-447.